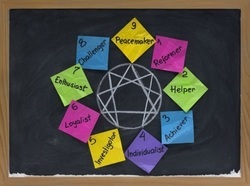 In spiritual direction practice, I often employ the Enneagram as a personality assessment. The word ennea comes from the Greek word for “nine” and grammos which means “figure.” The literal translation is a “nine pointed figure.” The Enneagram is a dynamic system of personality types that identifies nine unique approaches to life, respects all spiritual paths and traditions, and is a powerful tool for the discovery of emotional and thought patterns that can distract us from our experience of God and each other. The Enneagram is both a development of modern psychology as well as a system which has roots in ancient philosophical and wisdom traditions. It has a definite lineage from the Christian desert tradition of the second and third centuries, appears in medieval manuscripts, and is given a fresh presentation by modern spiritual teachers of various perspectives. As a personality assessment, it is primarily concerned with self-knowledge. While I value and utilize other personality assessments (such as the MBTI or Keirsey Temperament sorter), my first choice for those entering into spiritual direction is the Enneagram. This is because the Enneagram moves beyond individual preferences and talents to the identification of one’s underlying motivation – why people do what they do – which lends itself to an exploration of the healthy, average, and unhealthy behaviors extending from that motivation. The practical application includes improved relationships with business colleagues, friends, and family, as well as personal and spiritual growth. I like to start with a basic Enneagram typing Interview to determine and deepen your understanding of your Enneagram Type and Instinctual Subtype and using that to determine your core motivation. This is done through using a variety of Type tests and a personal interview. The interview will take you through the nine personality types defined by the Enneagram, and enable you to more clearly see your type, and how it affects you in relationships, as well as in your career. We discuss the path of your type's personal growth, and specific spiritual growth strategies and practices to deepen your understanding of yourself and others — and to enhance your personal resourcefulness and ability to successfully achieve your goals. As we progress, we will use the Enneagram as a tool which allows prayerful awareness of your personality and the “boxes” in which you unconsciously live. Gentle self-observation, aided by spiritual practice and a practical knowledge of the Enneagram, helps you to recognize, accept, and let go of reactivity, and become more fully present to yourself, others, and God. Would you like to discover your particular Enneagram style? Have you taken some Enneagram tests but are still confused? Do you know your Enneagram number but would like more in-depth information? Contact me for a Personal Enneagram Assessment. Once you discover your particular style, you can do more research on your own or we can work together to explore how your personality affects the various areas of your life. For a list of suggested Enneagram resources, click here. (Enneagram materials are on page 3 of the resource list). I also recommend the Enneagram Institute for more information. Also, I am available to conduct trainings, workshops, and retreats that utilize the Enneagram. For more information, contact me. Steve is a member of the International Enneagram Association.